Our Kickstarter campaign has been successfully funded. The end of an amazing journey marks the start of a new one. We launched our Kickstarter campaign on Day 56 and for the past 24 days we’ve been on an amazing journey. When we first decided to launch our campaign we were encouraged by the positive feedback from you, our readers, and the design community. We hoped that our excitement and passion for our project would carry over into our campaign. We had no idea just how much support we would receive. Our initial goal was to raise $7,500 dollars. When the last minutes of the campaign came to a close, and the final backers pledged their support, we reached a total of $18,502 dollars. 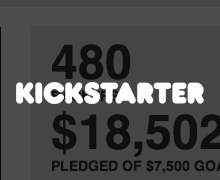 The book was 246% funded with a total of 480 backers. Amazing. We are humbled and so thankful to be part of such a wonderful community. There are 20 days left in the 100 Days of Design Entrepreneurship and we’ve got some great interviews in the line-up to round out the (we think, pretty amazing) content we’ve presented so far. The 100th day marks the opening of our graduate thesis exhibition, where we will showcase all that we’ve discovered, learned and synthesized from the last few months. We’re excited to continue to share our process with you as we move into the last stage of the 100 Days, we prepare to transition the blog beyond the 100 Days, and of course, we focus on the book. We owe so much of the success of this blog, and the success of our Kickstarter campaign to our dedicated, enthusiastic, and encouraging readers in the design and entrepreneurial communities. The Kickstarter platform has allowed us to share the journey, and reward of creating something meaningful, together. Thank you all. We are so excited to craft a book that lets these designers’ stories and experiences shine.